Sous Le Saix is a traditional Savoyard chalet with great views over three floors situated on the edge of Chatel village which is a lovely Savoyard ski village nestling at 1200 metres. 1480m2 of land and fields surrounds the chalet making this a perfect place for both summer and winter holidays. The river Drance is 400m away. The nearest ski lifts are 1km away in Chatel with direct access to the vast French/Swiss ski area of The Portes du Soleil (Avoriaz Morzine Champery Morgins). A free bus service operates (bus stop 50 m from the chalet) to the centre of Chatel and ski ing which runs every 20 mins approx during the day. The large and flat garden is ideal for children to play . The Supermarket Intermarche is 300m away. Skiing Information: Chalet Sous le Saix is ideally situated in The Portes du Soleil region on the French Swiss border which is the largest linked ski area in Europe. It includes Avoriaz, Morzine, Les gets, Chatel, La Chapelle, Les Crosets, Champery, Morgins and Torgon. Skiing conditions are good all season with the highest pistes being in Avoriaz at about 2450 metres.Local bus service runs regularly. Summer Information: Chalet Sous Le Saix is perfectly situated for a summer holiday with a great range of activities and sports including walking mountain biking tennis swimming horse riding rafting and paragliding. Lake Geneva is close by and offers all types of sailing and water sports. The lift system is open for walking and mountain biking in the summer season and it carries bikes up if you don't fancy the hard work! Logs are provided free of charge ! Please do not put more than 2 logs in the fire place . Remove all ashes from the fire place before departing . This is excluded from the cleaning fee. 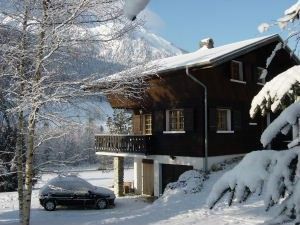 Entrance to chalet is equipped with a Ski Boot dryer for 5 pairs shoes . Get 15% off equipment hire at Ski Evasion , opposite the Linga telecabine. Accommodation includes: First Floor: lounge with fire place dining area and american style kitchen and separate WC. Large balcony accessed from lounge and kitchen. Five Double Bedrooms as follows: Top Floor: 2 doubles and a kids bedroom with 3 beds (2 bunks,1 pull out).Shower room and WC. Large balcony Basement : 2 double bedrooms with double beds. Separate shower room.WC.Mud Room. Childrens toys available. High chair, baby bath and cot for baby. The Chalet is centrally heated. Chatel is a traditional Savoyard farming village and Ski Resort nestling at 1200 metres next to the Swiss border and with fantastic skiing and is linked directly to Avoriaz and the Portes du Soleil with 650km of pistes.